The initial inches of the golf swing, called the takeaway, put the club on its path and plane. A sound takeaway is a key to making a solid backswing – and producing consistently accurate, powerful hybrids shots. 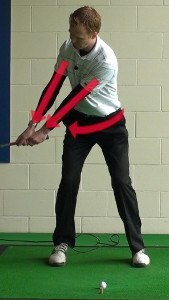 Maintain the triangle formed by the left and right arms as you pull the club back. The wrists should not begin hinging yet. Rotate the shoulders and chest in unison with the arms. The left hip should begin to turn right as the hands reach the right knee. 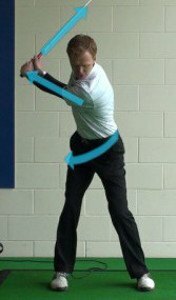 Avoid keeping the arms and wrists too rigid as you draw the club back. Your shoulders, chest, torso and hips continue rotating; the wrists should hinge naturally when reaching waist height. If the club’s toe points straight up at this juncture, everything’s in sync. If you’ve made a full turn, the club should be parallel to the ground or just short of it at the top of the backswing. The left heel may be raised slightly off the ground. The right knee remains flexed, with your weight favoring the right foot.